I bought this car to use as my daily driver here in the North of Scotland. Here we have more corners than straights, and no motorways (and few dual carrigeways), so the late M110 2.2 litre engine was the preference over the heavier and more thirsty 6 cylinder versions. 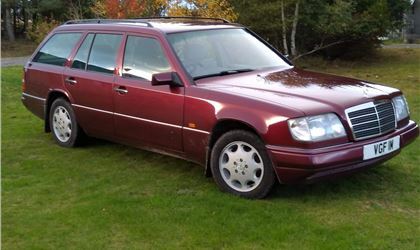 I have had the known issues to deal with - engine bay wiring loom, front knuckle joints and rear wheel bearings, none of which were cheap, but at least the parts were available, and will now last another 150,000 miles. The car is an absolute pleasure to drive, and all the stories about it being built to the highest engineering standards are true. Everything works - perfectly - every time. Although not "fast" in a straight line, it covers ground remarkably quickly, due to the quality of the suspension set up and the brakes. A part of the secret of running these vehicles is to find a good, local specialist who can help you maintain it. I am lucky in that there is such a garage in Inverness (Moray Firth Motors) and they have been superb. A concern was of how well it would cope with winters up here, and in particular, the snow - after all, a two wheel drive, rear wheel drive, automatic?? I fitted a set of Michelin Cross Climate + tyres - problem solved in one fell swoop. It'll climb a donkey's backside, honestly! Can I think of anything more modern with which I would want to replace it - absolutely not. Thank you, Mercedes! !